Anyway quite recently on my current project I had an interesting situation regarding unit testing with Mockito and JAXB structures. We have very deeply nested JAXB structures generated from schemas that are provided for us which means that we can't change it in anyway. 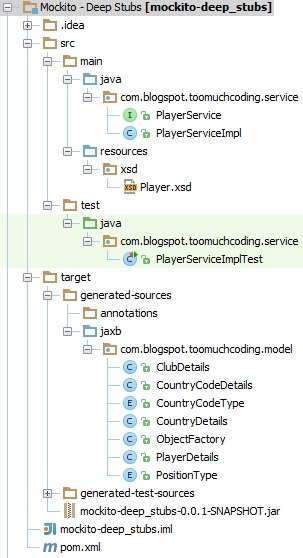 The project structure is pretty simple - there is a Player.xsd schema file that thanks to using the jaxb2-maven-plugin produces the generated JAXB Java classes corresponding to the schema in the target/jaxb/ folder in the appropriate package that is defined in the pom.xml. Speaking of which let's take a look at the pom.xml file. 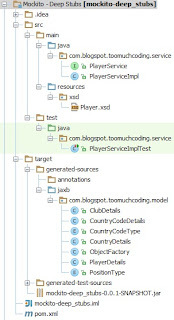 Apart from the previously defined project dependencies, as mentioned previously in the jaxb2-maven-plugin in the configuration node you can define the packageName value that defines to which package should the JAXB classes be generated basing on the schemaDirectory value where the plugin can find the proper schema files. So what happened here is that you use the Mockito.mock(...) method and provide the RETURNS_DEEP_STUBS answer that will create mocks automatically for you. Mind you that Enums can't be mocked that's why you can't write in the Mockito.when(...) function playerDetailsMock.getClubDetails().getCountry().getCountryCode().getCountryCode().getValue(). Summing it up you can compare the readability of both tests and see how clearer it is to work with JAXB structures by using Mockito RETURNS_DEEP_STUBS default answer. Naturally sources for this example are available at BitBucket and GitHub.